The black-footed ferret (Mustela nigripes) is a small carnivorous North American mammal closely related to the steppe polecat of Russia, and a member of the diverse family Mustelidae which also includes weasels, mink, polecats, martens, otters, and badgers. It should not be confused with the domesticated ferret. The black-footed ferret is the most endangered mammal in North America. They became extinct in the wild in Canada in 1937, and were classified as endangered in the U.S. in 1967. The last known wild population was taken into captivity in the mid-1980s, a few years after its accidental discovery in Wyoming. Black-footed ferrets are about 18 inches long, with a furry 6 inch tail, and they weigh roughly 2 pounds. Like most members of the family, they are very low to the ground with an elongated body and very short legs. Their fur is white at the base but darkens at the tips, making them appear yellowish-brown overall, with black feet and tail-tip, and a distinctive black face mask. These blend in well with the prairie ecosystem in which they live. They do not change their habitat over the seasons. Even before their numbers declined, black-footed ferrets were rarely seen: they weren't officially recognized as a species by scientists until 1851, following publication of a book by naturalist John James Audubon and Rev. John Bachman. Even then, their existence was questioned since no other black-footed ferrets were reported for over twenty years. They are nocturnal hunters that are almost entirely dependent on a plentiful supply of prairie dogs to prey on, and shelter in a prairie dog burrow during the day. A single family of four black-footed ferrets eats about 250 prairie dogs each year and cannot survive without access to large colonies of them. Historical habitats of the black-footed ferret included shortgrass prairie, mixed-grass prairie, desert grassland, shrub steppe, sagebrush steppe, mountain grassland and semi-arid grassland. Black-footed ferrets use prairie dog burrows for raising young, avoiding predators and thermal cover. High densities of prairie dog burrows provide the greatest amount of cover for black-footed ferrets. Black-footed ferrets are believed to be polygynous. Mating occurs in February and March. When a male and female in estrus encounter each other, the male sniffs the genital region of the female, but does not mount her until after a few hours have elapsed. During copulation, the male grasps the female by the nape of the neck, with the copulatory tie lasting from 1 1/2 to 3 hours. Unlike other mustelids, the black-footed ferret has low reproductive rates. Gestation of black-footed ferrets lasts 42–45 days. Litter size ranges from 1–5 kits. Kits are born in May and June in prairie dog burrows. Kits are raised by their mother for several months after birth. They first emerge above ground in July, at 6 weeks old. They are then separated into individual prairie dog burrows around their mother's burrow. Kits reach adult weight and become independent several months following birth, from late August to October. Sexual maturity occurs at one year of age. The black-footed ferret is solitary, except when breeding or raising litters. They primarily hunt for sleeping prairie dogs in their burrows. They are most active above ground from dusk to midnight and 4 am to mid-morning. Above ground activity is greatest during late summer and early autumn when juveniles become independent. They are inactive inside burrows for up to 6 days at a time during winter. Female black-footed ferrets have smaller home ranges than males. Home ranges of males may sometimes include the home ranges of several females. Adult females usually occupy the same territory every year. Black-footed ferrets may travel up to 11 miles to seek prey. The loss of their prairie grassland habitat, hunting, the drastic reduction of prairie dog numbers through both habitat loss and poisoning, canine distemper and sylvatic plague all contributed to the near-extinction of the species during the 19th and 20th centuries. For a time, the black-footed ferret was harvested for the fur trade. The large drop in black-footed ferret numbers began during the 1800s, lasting through the 1900s, as prairie dog numbers declined because of "control programs" and the conversion of prairies to croplands. Sylvatic plague, a disease introduced into North America, also contributed to the prairie dog die-off. Inbreeding may have also contributed, as studies on black-footed ferrets revealed low levels of genetic variation. 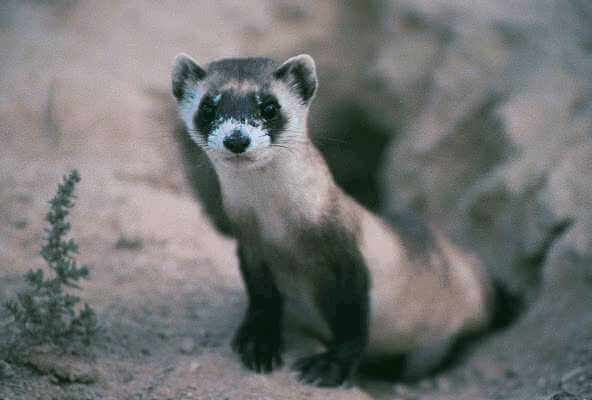 Canine distemper devastated the Meeteetse ferret population in 1985. A live virus vaccine originally made for domestic ferrets killed large numbers of black-footed ferrets, thus indicating that the species is especially susceptible to distemper. In 1981, a very small population of about 130 animals was discovered near Meeteetse, Wyoming. Soon after discovery, the population began a rapid decline due to disease. By 1986, the Wyoming Game and Fish Department led a cooperative program to capture the 18 remaining animals and begin an intensive captive breeding program. At that time, the entire world population amounted to about 50 individuals in captivity. U.S. federal and state agencies, in cooperation with private landowners, conservation groups, Native Americans, and North American zoos, have been actively reintroducing ferrets back into the wild since 1991. Beginning in Wyoming, reintroduction efforts have since expanded to sites in Montana, South Dakota, Arizona, Utah, Colorado and Chihuahua, Mexico. Proposed reintroduction sites have been identified in Canada. Currently, about 1,200 ferrets are thought to live in the wild. Conservation efforts have been opposed by stock growers and ranchers, who have traditionally fought prairie dogs. In 2005, the U.S. Forest Service began poisoning prairie dogs in private land buffer zones of the Conata Basin of Buffalo Gap National Grassland, South Dakota. When a few ranchers complained the measure was inadequate, the forest service expanded its "prairie-dog management" in September 2006 to all of South Dakota's Buffalo Gap and the Fort Pierre National Grassland, and also to the Oglala National Grassland in Nebraska, against opinions of biologists in the U.S. Fish and Wildlife Service. Following exposure by conservation groups and national media, public outcry and a lawsuit mobilized federal officials and the poisoning plan was revoked. Despite significant recovery successes, the black-footed ferret remains one of the most endangered animals in the world. The primary reasons the species remains at risk are the same that nearly caused the animal’s extinction. Conversion of native grasslands to agricultural land, widespread prairie dog eradication programs, and fatal, non-native diseases have reduced ferret habitat to less than two percent of its original range. The remaining habitat is now fragmented, with prairie dog towns separated by expanses of agricultural land and other human developments. Poisoning and shooting of prairie dogs continues, threatening both prairie dogs and black-footed ferrets. There are no known black-footed ferret populations that were not reintroduced. All those populations remain small and fragmented. They have lost about 90 percent of their genetic diversity, which can lead to inbreeding, health issues and reduced reproduction. Without the protection of prairie dogs, black-footed population could dwindle again and be lost forever.